What Type of Relationship Do You Have with Learners? In highly didactic instructional classrooms Educators have total control and make all of the decisions. At the opposite end of the education spectrum with counter-culture student driven education where Educators have little control and make few decisions about student learning. 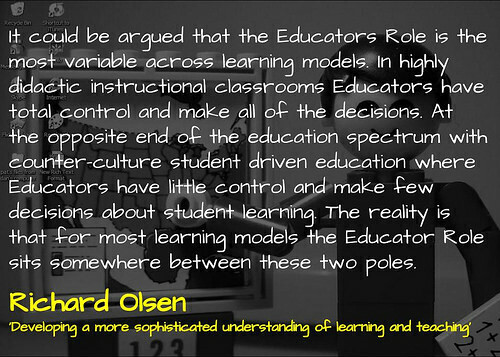 The reality is that for most learning models the Educator Role sits somewhere between these two poles. What stands out about these variables is change in relationship that exists between learner and educator. I was reminded of this connection yesterday while I was watching a new television series Soundbreaking: Stories from the Cutting Edge of Recorded Music. The particular episode I saw investigated the recording artists and the producers behind them. What was most interesting was the relationship each producer had with the artists they were working with. The show touched on four particular producers: Phil Spector, Sir George Martin, Dr, Dre and Rick Rubin. The Wall of Sound: A pioneer in the recording industry, Phil Spector had the ability to push the technology to its limits. He had the ability to hear things and imagine different possibilities. Innovative, he turned the traditional orchestral outfit into a rock band. This organised chaos came at a cost as he was very demanding on the artists he worked with. What kept many there though was that you always knew he would produce something amazing. The Fifth Beatle: Unlike Spector who led the show, Sir George Martin worked along side The Beatles. It was for this reason he was described as the fifth Beatle. He would listen to what the band would bring and provide a different take on things. Something akin to what Cathy Davidson calls ‘collaboration by difference‘. The example given in the show was his suggestion to include strings in Yesterday or to create the Psycho-inspired Elenor Rigby where strings and vocals were the only instruments at play in. Artist as Producer: Whereas Martin was a guide on the side, Dr. Dre represents the move to the producer as a meddler in the middle. Building on heritage of those like Sly Stone, Dr. Dre worked both sides of the desk. What is most significant is that Dre’s success was built around capturing things that nobody else heard, whether this be in the records he sampled or the music he recorded. This change was in part enabled by improvements in technology, making production more accessible. Conditions to Flourish: The producer behind artists from Metallica to the Dixie Chicks, Rick Rubin’s interest was not about creating a particular sound, but rather fostering the conditions in which the artists could bring out their potential. The example given was his work with Johnny Cash in regards to the American Recordings. After being dumped by several labels, Rubin worked with Cash to reimagine the legend. For more on Rubin’s unique approach, I recommend listening to the lengthy interview with Tim Ferriss. Coming back to Olsen, it is interesting to compare different relationships between the artist and producer with the relationships between the educator and the learner. It is not hard to think of an educator who continually celebrated about the results they get, even if the strategies that they use seem questionable. Or of the educator who works alongside learners helping connect their work to what Seymour Papert describes as ‘powerful ideas‘. Then there are learners/educators who take control of their own learning and publish it to the world for validation. Or those educators whose success is hard to measure or make sense of, rather it is about connecting with the passions of each learner and starting there. In the end, maybe it takes all types of relationships to support all types of learners. In part this post was inspired by the continual work of Deborah Netolicky on educator identify. I highly recommend listening to her interview on the Teacher’s Educator Review. What Type of Relationship Do You Have with Learners? by Aaron Davis is licensed under a Creative Commons Attribution-ShareAlike 4.0 International License.